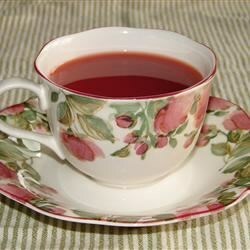 "I have looked for recipes for hot cranberry tea that are simple and don't involve a lot of time. This is it! My mother is a cook who adds until it tastes good. This is what she came up with. Increase or decrease quantities to suit your own taste." Combine the orange juice, cranberry-raspberry juice, pineapple juice, and cinnamon candies in a large stockpot; cook over high heat until the candies dissolve. Combine the water and tea bags in a separate pot and bring to a boil; reduce heat and simmer 5 to 10 minutes; pour into juice mixture. Serve hot.